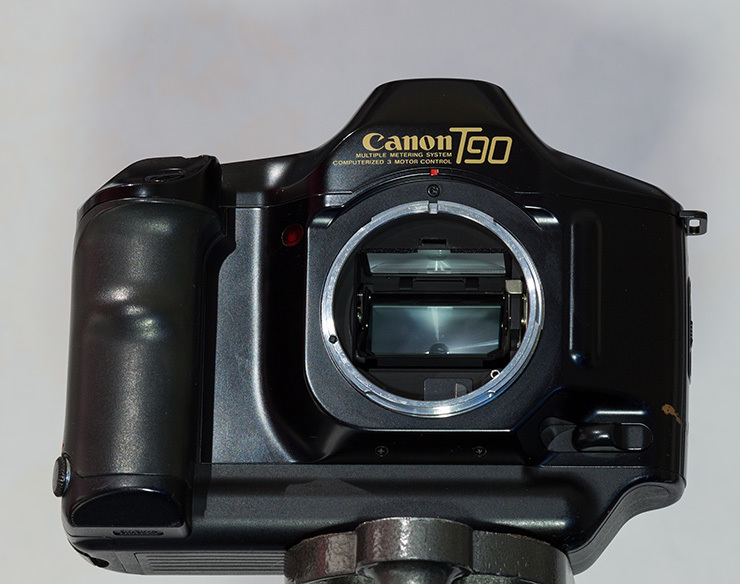 A groundbreaking design departure for Canon, and one which established the pattern for almost every DSLR they sell today. 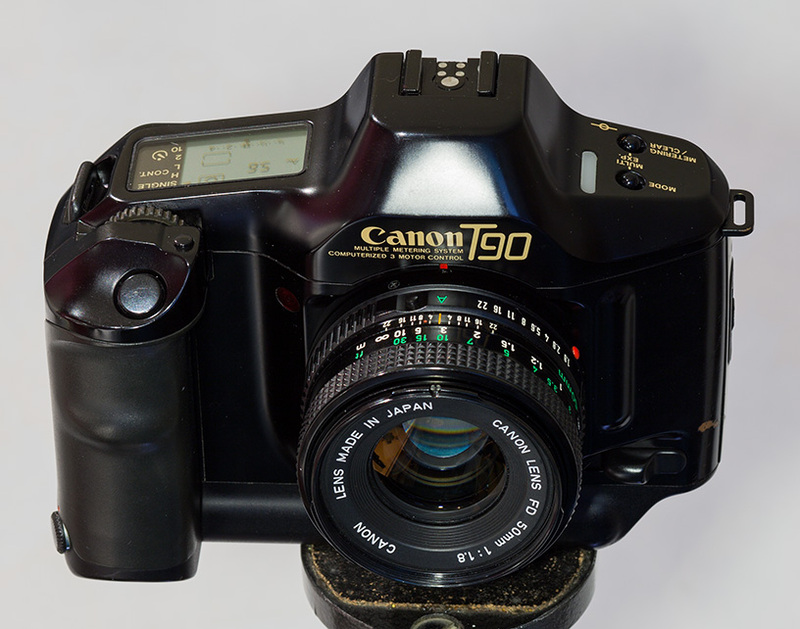 When it was introduced in 1986, the T-90 represented the most sophisticated automatic exposure system available, and it was the last serious FD mount camera to be made by Canon. 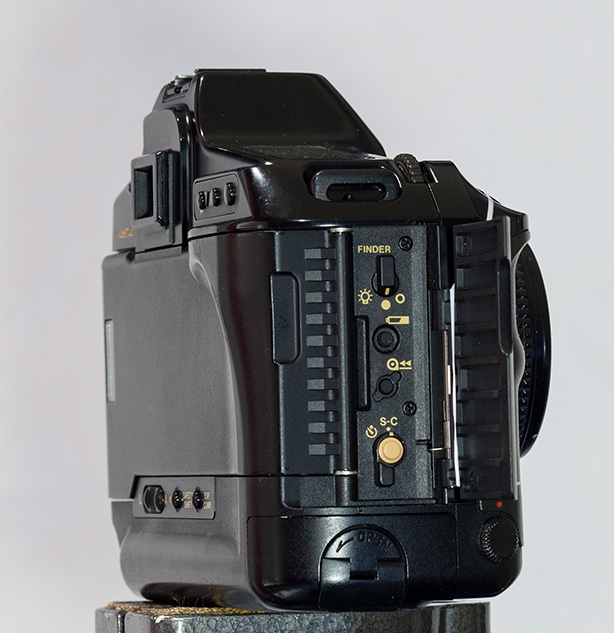 With the ever increasing presence of computerized functions there was a feeling that cameras were becoming too complicated in use. For the first time Canon engineers went outside the company walls to collaborate with German designer Luigi Colani, who was well known for his organically influenced industrial designs. 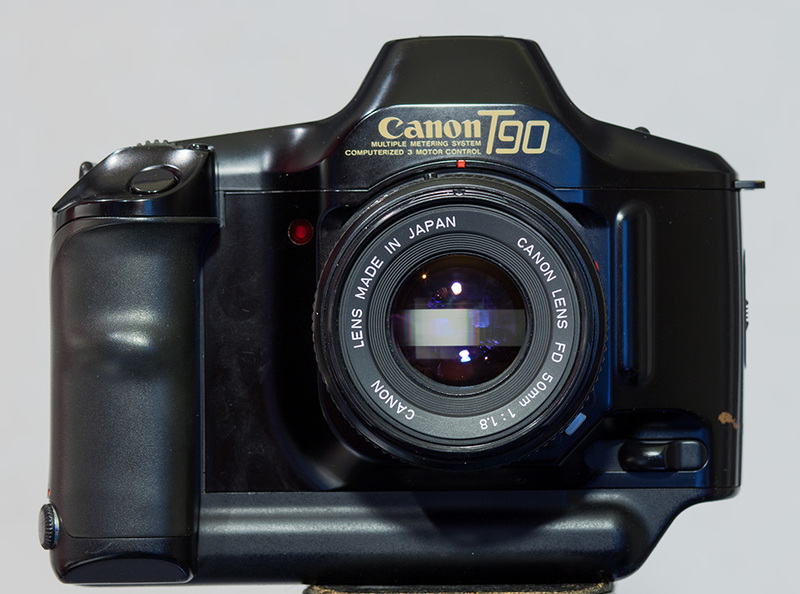 The result was a camera whose significance it’s almost impossible to overstate: this laid down the blueprint for almost every SLR/DSLR that followed. Pictographic LCD display, multiple wheeled control inputs, integrated grip/winder – so very many things that today are ubiquitous appeared here first. 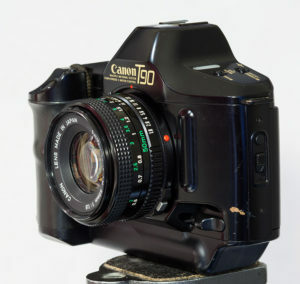 The timing of course was terrible for a manual focus SLR, and the T-90 was quickly eclipsed by the EOF range of auto focus models with which it was incompatible. 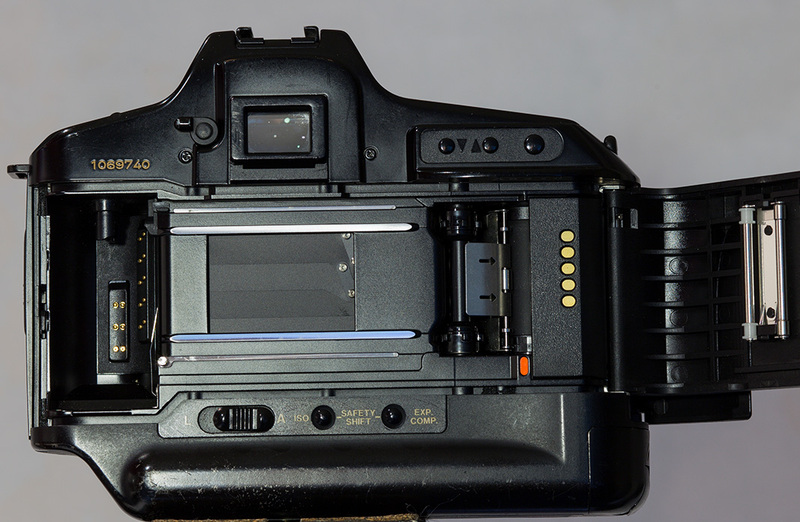 Vertical, metal bladed shutter offering 30s – 1/4000th; auto film load and advance, auto ISO setting from DX coded canisters, 4.5 fps continuous shooting. 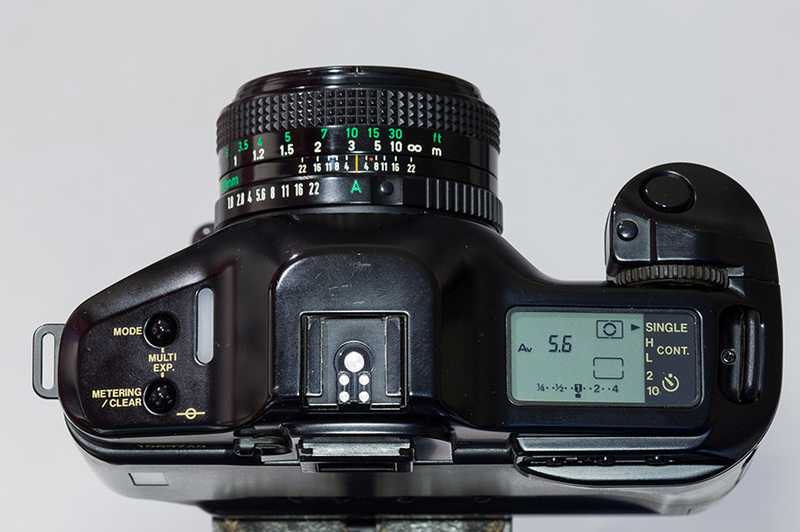 Perhaps most notable to the serious photographer were the sheer number of metering and exposure modes offered. Undeniably set the trajectory for every SLR and DSLR made since; it’s a very significant design. Acquired by me brand new in 1986, within months of launch. I traded a Bronica ETRS with two lenses for a brand new T-90 at City Photographic in Bedford Place, Southampton. 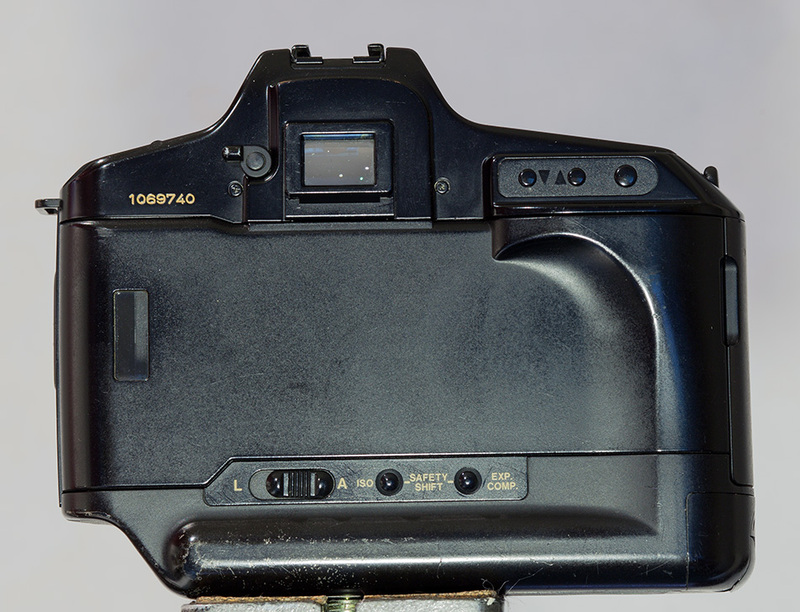 It’s picked up quite a few scrapes since, and some battery corrosion on the terminals means it’s sometimes fussy about advancing film, but this was a fantastic camera for me for many years.